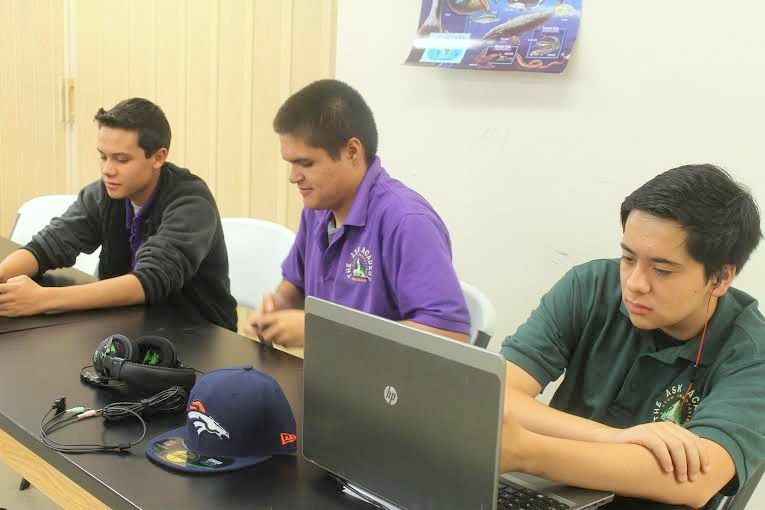 — A group of juniors sport the green and purple polos – representing the biomedical pathway. To many, the ASK Academy uniform has become second nature. Dan Barbour, co-founder of ASK said the main reason for the uniforms was to prepare scholars for any type of career they may go into. “Most jobs these days require some type of uniform, even if you work at McDonalds or Wal-Mart; there is still something specific you are required to wear,” he said. This is the Academy’s fifth year of existence, but only the fourth year that the uniforms have been implemented. It is mandatory that every scholar wear either black or khaki pants and the ASK Academy polo. Depending upon the pathway, the polo’s can be red, blue, green and purple. The middle school scholars wear light blue or bright red polo’s. The uniforms were designed by scholar council and were originally only one color, but that changed to give scholars more options. “The uniforms are very cost effective for families. You can buy a couple of inexpensive shirts, black pants, and that’s all you really need,” Barbour said. The ASK Academy also has a small store that sells used uniforms so scholars who grow out of their uniform or graduate can donate them for other scholars to re-use. 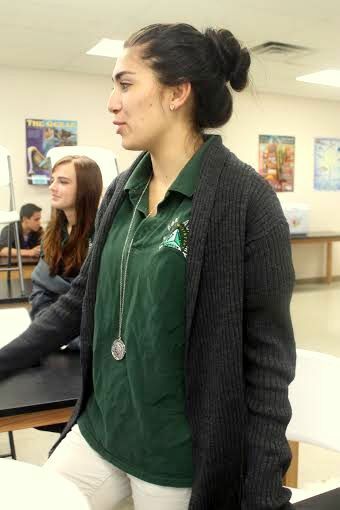 –Senior Sarah Roy adds jewelry and a cardigan to her polo. Since the ASK logo is still showing, this is an acceptable way to wear the uniform. Despite the restrictions, some scholars have made an attempt to individualize their uniform, whether it’s with a flannel shirt, a cardigan, or a scarf. There are also some scholars who bend the rules without breaking them. “One of the biggest things scholars try to get away with is wearing sweatshirts that cover the logo on their polo,” Barbour said. Some studies have shown that wearing a uniform and dressing professionally encourages the student to behave accordingly; other theories are that new fashion trends can be a distraction during the school day, as scholars may be more focused on who has what brand of clothing than their studies. In the end, the uniforms at The ASK Academy were implemented to create a better learning environment for scholars and to prepare them for professionalism in their future careers. I’m also in favor of uniforms, they help me save money and decide what to wear. I believe uniforms should not be required because everyone looks the same and aren’t able to express themselves. I understand the purpose of having uniforms, but I tend to personalize the uniform with varies items. During the fall and winter, I wear sweaters and scarfs, but some people may get in trouble with just a scarf or a sweater that covers half of the logo. If we had an option to change the female uniform to a skirt, similar to private school uniforms or ones seen in anime, I think we could add more individuality we girls do not look like the guys; which may also add more variation. A lot of students here at ASK love watching anime and the school uniforms they show. It may not happen to change the uniform, but it is my opinion. The uniforms do have a great meaning behind it, and this article helps scholars understand the uniform and helps the mangers say their point on the idea.